Viewpoint Tickets - Best prices on Brewers tickets, Orioles tickets, MLB tickets and MLB All Star tickets. Location: About one mile northwest of downtown Milwaukee in the eastern part of a block bound by West North Street on the north, North 16th Street on the east, North 18th Street on the west and West Lloyd Street on the south. 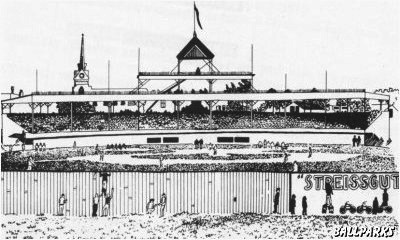 The field faced due north, so Lloyd Street ran directly behind home plate and the grandstand. Fences: 20 feet (canvas screen). Image of Lloyd Street Grounds courtesy of Gordon Tindall. Tickets to Baltimore Orioles, Milwaukee Brewers, NCAA Basketball Tournament, College Football Bowl, NCAA Football and Paul McCartney provided by Ticket Triangle.